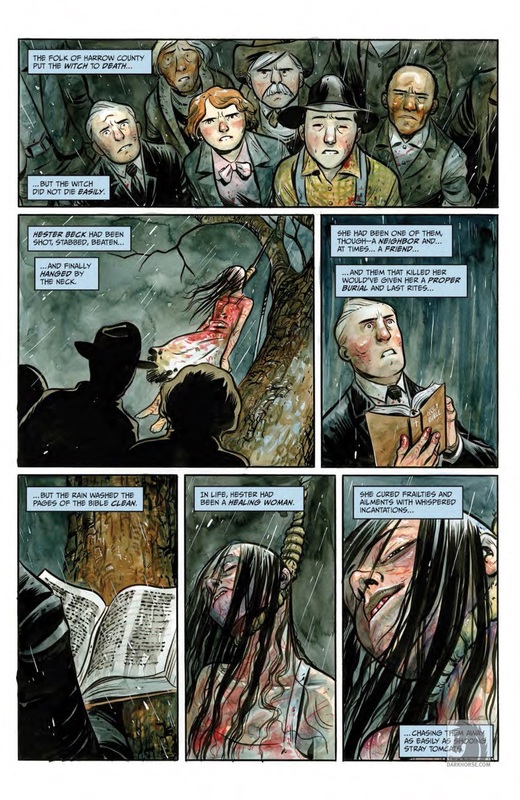 There’s nothing quite like good horror comics. The dark marriage of words and art that give shape to nightmares, planting seeds for future ones. The chill in your bones as the work’s intention takes on clarity, and the revelations that leave a pit in your stomach. The feel of the pages, sweat-slicked by fingers that can’t turn to the next one quick enough. 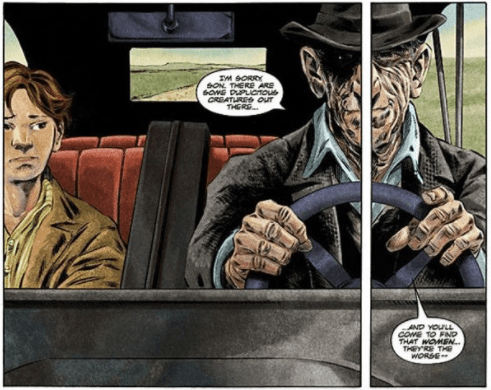 Many of the earliest comic books were horror centric, and it is a medium that invites ghastly tales that shift with our cultural fears and reach our hands more quickly than any other storytelling medium. We’ve picked five comics that highlight particular modern fears in the year 2017. From the secret history of American wealth, the undying clown who laughs at our fear of death, and the cannibalizing of dreams, here are some of our favorite horror comics for this Halloween season. Jonathan Hickman’s subject matter might seem an unlikely choice for a horror comic. The financial devastation of the 1929 stock market crash seems a dismal subject, but not a gory one. Only, what if the wealthy financiers at the height of the U.S. economy had built that wealth not through clever dealings, but sinister ones? What if they tapped into something much more dark than opportunism and used outright human sacrifice to earn their wealth? 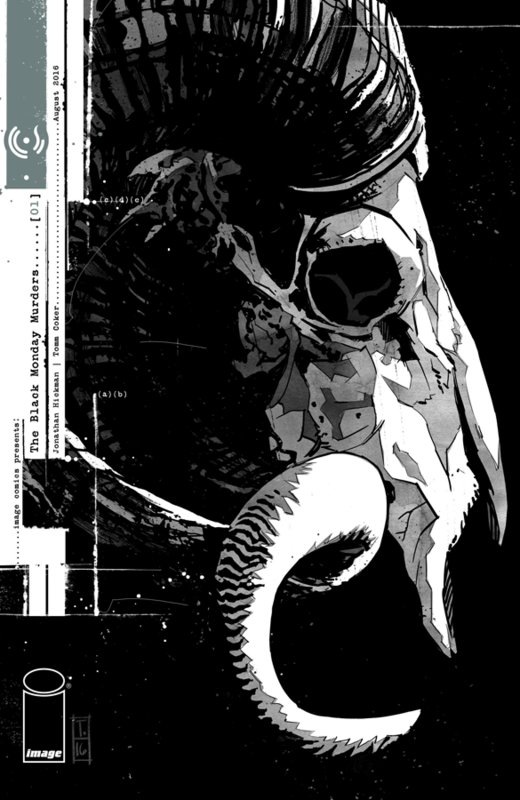 Such is the premise of The Black Monday Murders, the latest from the author of East to West, Avengers, and Fantastic Four. Families have pledged their loyalty to branches of the occult in a blood pact in exchange for the greatest wealth imaginable. When one of those tycoons is brutally murdered in ritualistic fashion, the detective who arrives to investigate has more to help him than intuition. Hickman highlights careful methodology though, making this book a delight for a true crime fan. The story is dense, rich with both text and redacted documents that give the story grounding in reality. That contrast with the occult only serves to heighten both the plausibility of the story and its horror. After all, who amongst us hasn’t imagined the worst from the One Percent? In the 1930s, the townsfolk of a sleepy southern town put Hester Beck to death when her witchcraft goes too far, threatening the children of the town. She is shot, stabbed, and hung to no avail. They must burn her to truly end her life. But before the witch dies, she promises vengeance on the townsfolk. 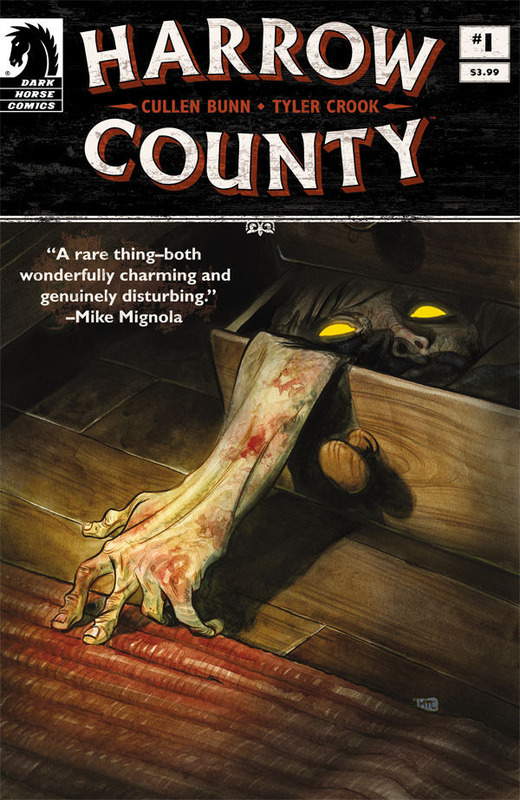 Harrow County is the story of how she pursues that debt. Emmy is the 18-year-old protagonist of the story, learning about her unusual gifts and the adult world in equal measure. Her naiveté is both charming and undoubtedly the reason she finds herself in so many surreal situations. 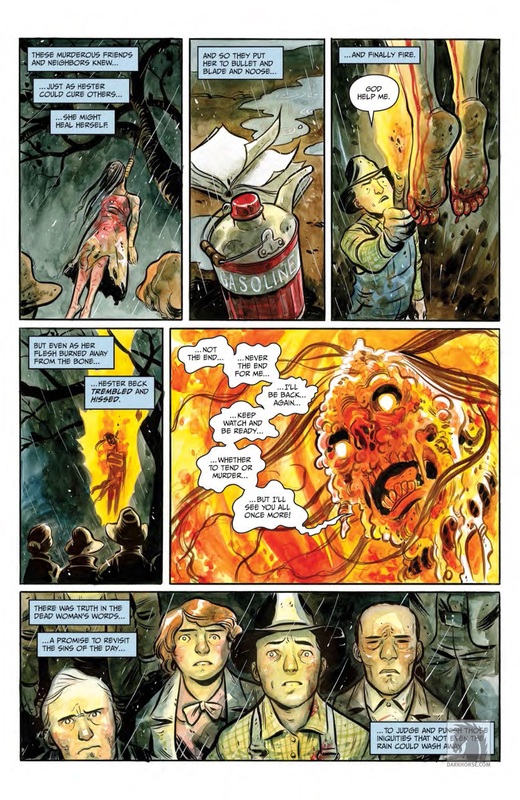 Harrow County is a true coming-of-age story with interesting metaphors about how women are cared for and then feared as they attain a certain sense of ownership over their selves. As Emmy uncovers the truth about what surrounds her farm, she must negotiate who she is and where she fits within her world. 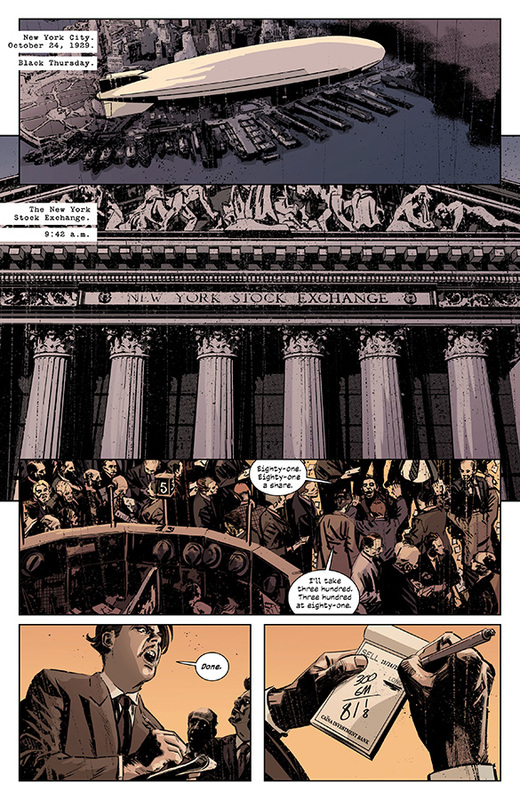 Cullen Bunn’s tale begins remarkably simple, but the reveals are sometimes alarming and often gory. 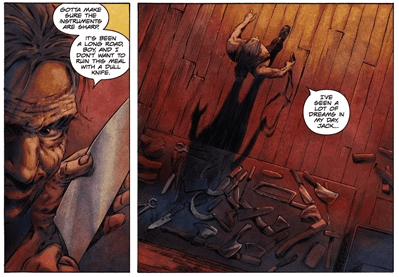 The Sixth Gun and Uncanny X-Men writer has a talent for the slow reveal and he wields plot twists expertly. Recent years have seen the character of the Joker get served very well by writers on the main Batman title. Grant Morrison (who created one of the most iconic depictions of the Joker in Arkham Asylum) reinvented the character twice, first as the remorseless Thin White Duke of Death and then as the semi anti-hero Oberon Sexton. 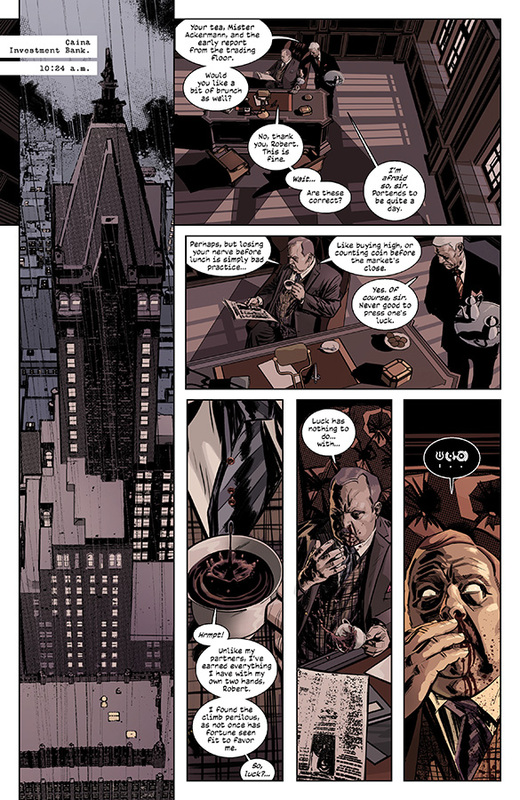 The character only briefly appeared during the DC reboot in the first issue of Detective Comics which ended with his face being removed and him disappearing. It wasn’t until a year later that Scott Snyder brought him back in the seminal Death of the Family. 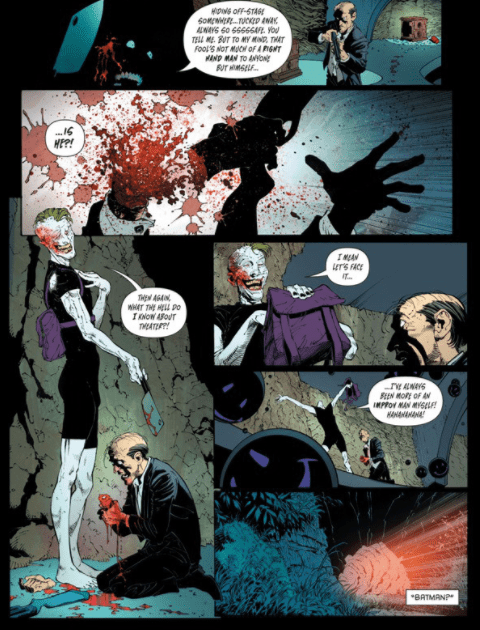 For this arc, the character becomes a gross, faceless, lovesick obsessive towards Batman and tries to kill off Batman’s family to remove the obstacles between the two enemies. This plan fails, though he does drive a wedge between Batman and the Bat-family, and the Joker is assumed dead. 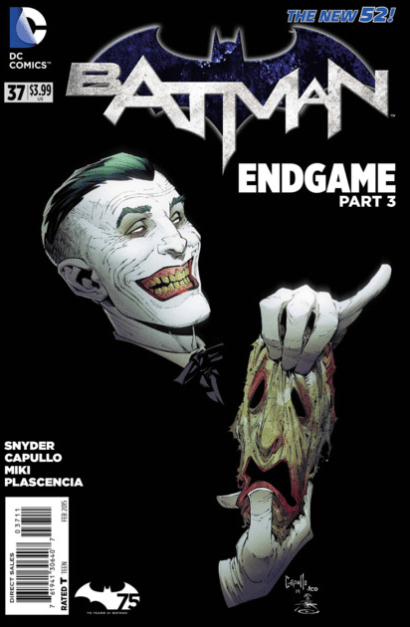 He reappeared nearly twenty issues later (though he had been hiding in plain sight disguised as an asylum orderly) and for the Endgame arc, Snyder flipped the character again. The Death of the Family romantic was gone, replaced with a hate-filled killing machine out to destroy Batman and Gotham. Before taking the reins of a ground-breaking run on Batman, Scott Snyder was crafting horror stories. While Severed couldn’t be more different from Synder’s later takes on superheroes, here along with writing partner Scott Tuft, he delivers the same consideration of our anxieties. 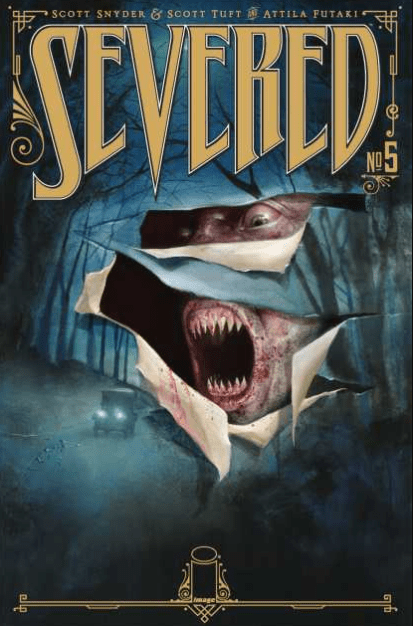 Severed is a raw slice of Americana, Norman Rockwell turned sour, and a crushing look at American Dreams and a country defined by a man who seems to change, but never really does. Set in 1916, Severed follows twelve-year old Jack Garron who runs away from home in search of his father, a fiddler, who he’s never met. Jumping a train South, Jack befriends Sam, an orphan girl disguised as a boy, and together the two of them get by on panhandling and trust in an America that’s lacking it. But there’s another figure on the road, a nameless man who’s been traveling the road for centuries, looking for children to devour, whose dreams make them taste all the sweeter. When this cannibal befriends an unwitting Jack and breaks the trust between him and Sam, Snyder and Tuft takes us on a horrific road trip, populated by long stretches of empty spaces and people looking to get by however they can. Forget everything you think you know about Sabrina, the Teenage Witch. If you’re a child of the 90s like myself, your introduction to Sabrina was probably from the ABC television show staring Melissa Joan Hart. But before she was a TGIF show, Sabrina was a supporting character in the Archie comics in the neighboring town of Greendale. Robert Aguirre-Sacasa, who re-invented Archie and his gang in The CW series, Riverdale, delivers the same dark yet true to character take on Sabrina and her world. The comic will also serve as the basis for a new horror-centric Sabrina show on The CW. 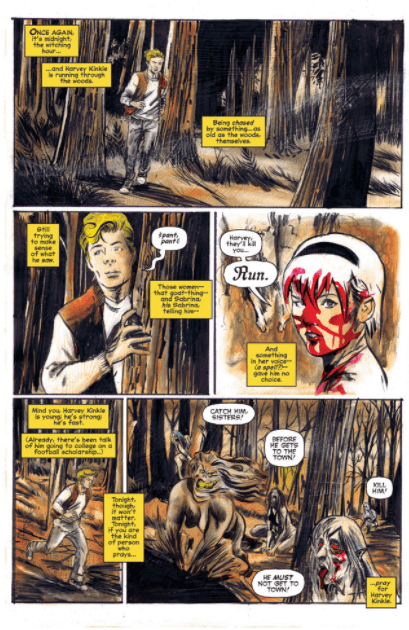 Inspired by Rosemary’s Baby, The Omen, and Neil Gaiman’s Sandman, The Chilling Adventures of Sabrina doesn’t modernize her story but instead sets it in the same 60s period as the original series. But gone is idealism of the comics of that bygone era, and instead Aguirre-Sacasa delivers a Greendale of prejudice, sexuality, and clashing morals against the hidden but all too powerful church of Satanism. 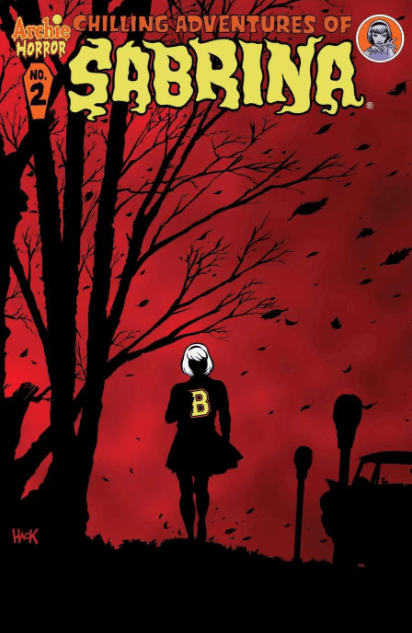 A horror coming of age story, Chilling Adventures finds half-witch Sabrina Spellman dealing with high school and burgeoning powers, while the sins of her father make their way to wreak havoc on her life. 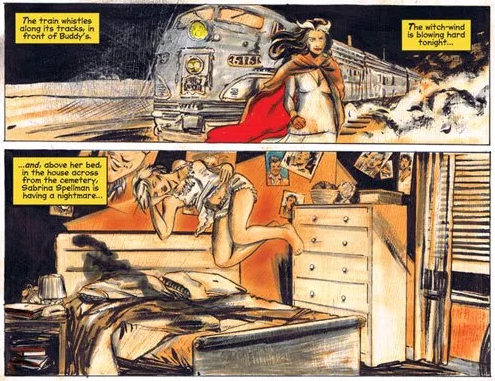 As Sabrina debates whether to give herself fully to Satan on her sixteenth birthday and become a true witch, or whether to live a normal life with her boyfriend Harvey Kinkle, Madam Satan sets her own plans for Sabrina. Madam Satan, the once jilted lover of Sabrina’s father before he chose a mortal woman through which to conceive Sabrina, establishes herself as Greendale’s new drama teacher while enlisting the aid of Riverdale girls, Betty and Veronica, to entirely upend Sabrina’s life.